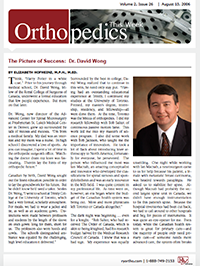 From the halls of Trinity College to the Presidency of the North American Spine Society, Dr. Wong has cut a distinguished, scholarly, yet eminently approachable figure among spine surgeons. 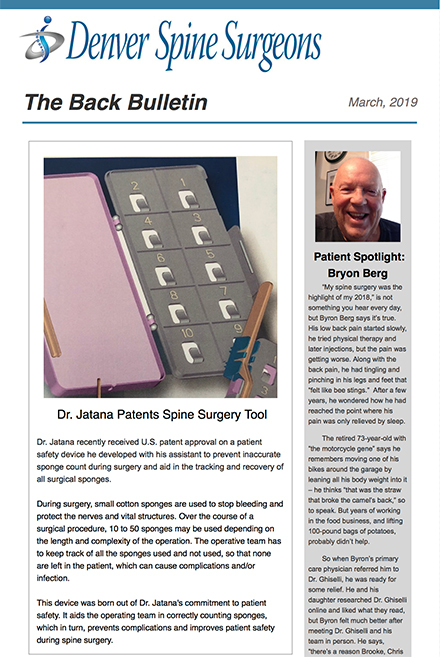 This week’s Picture of Success, Dr. Wong offers one of most articulate and cogent visions of the future of spine surgery we’ve heard yet. To learn more from this extraordinary person, click here or select the article to the left. Article credit RRY Publications LLC, www.ryortho.com. 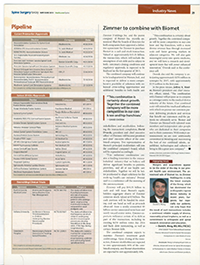 Read Dr. David Wong, Spine Surgery Today Editorial Board member’s perspective on the Zimmer/Biomet merger. Click here. 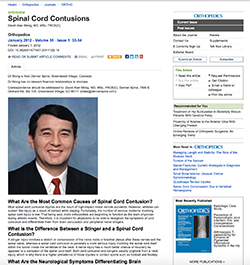 Most spinal cord contusion injuries are the result of high-impact motor vehicle accidents. However, athletes can sustain this injury as a result of contact while playing. Fortunately, the number of serious incidents involving spinal cord injury is low. That being said, more orthopedists are beginning to function as the team physician during athletic events. 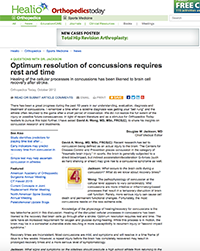 Therefore, it is important for physicians to be able to recognize the symptoms of cord contusion and differentiate them from brain concussion and peripheral nerve stingers. Click here to read the complete article interview. There has been a great progress during the past 10 years in our understanding, evaluation, diagnosis and treatment of concussions. I remember a time when a sideline diagnosis was getting your “bell rung” and the athlete often returned to the game after a short period of observation. We did not realize the full extent of the injury or possible future consequences.